The most obvious benefit is accessibility. Transform inaccessible space into usable area for people with disabilities and those who have difficulty using stairs. Ease of Use - The platform controls are large and easy to use. The buttons are 2" in diameter, illuminated and protrude from the surrounding surfaces. This makes the X3 easy to use for people with limited dexterity in their hands. The buttons are also positioned on an angle towards the user. The X3 is available with fully an automatic folding platform, which includes powered boarding ramps and barrier arms. In many residential applications, wall mounted call station controls are not required. However, when they are required, the call stations for the X3 are wireless. This allows for the controls to be installed on the wall without the need to run conduit from the lift to the controls. The installation is cleaner, simpler and faster. Cost-effective - The cost of the Garaventa X3 inclined platform lift is significantly lower than many other accessibility alternatives. Convenience - When stairs in a home or office become a challenge for people, sometimes they must be hand carried or lifted in their wheelchair step by step. Not only does this contravene public accessibility requirements, This can be extremely dangerous for everyone involved. 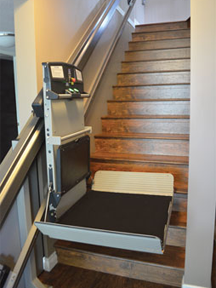 The installation of an X3 alleviates the difficulties of moving up and down the stairs and provides a safe, code-compliant and efficient method of travel to another level. Compact and Space Savings - When folded, the X3 takes up a minimal amount of space and will not effect other users of the stairway. Safety - The X3 is equipped with standard safety features including curved safety arms, multiple safety sensors, and an emergency stop switch. Short Delivery & Installation Time - Standardized components allow Garaventa Lift to provide you with a lift configured to suit your stairway with a short delivery time. Installation is usually accomplished within a single day and does not typically require any modifications to existing structures. Experience - Garaventa Lift has been providing accessibility solutions for commercial and residential projects for over 35 years, having installed over 50,000 lifts worldwide. Service - Maintenance of any kind of equipment is crucial to ensure continued service. Your local authorized Garaventa Lift representative has the training, expertise and the spare parts to keep your X3 operating properly for years.